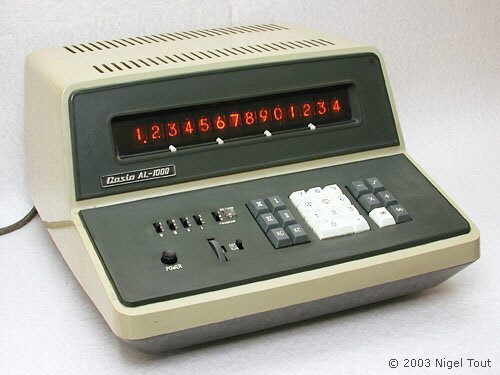 Programmable calculator, introduced in 1967. Distinctive features: 30-step programmable calculator employing a magnetic core memory. Capabilities: 4 functions, square root, 4 memory registers, 30-step programmable. Can be coupled to a typewriter to give semiautomatic operation. Display: 14 digits, "Nixie"-type tubes. Size: 380 x 440 x 238 mm (15" x 17.3" x 9.4"), 12.3Kg (27lbs). Technology: Ten circuit boards, each 320x200 mm / 12.5x8". 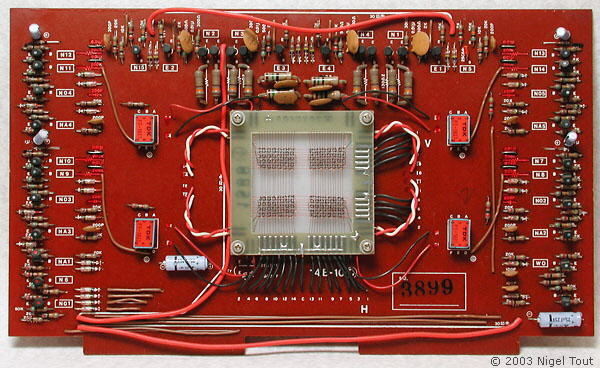 The logic and display boards hold a total of 284 individual transistors and 1500 diodes. The transistors are predominantly Toshiba 2SC371. Magnetic core memory is used - see article below. Made by Casio Computer Limited, Tokyo, Japan. Close up of the keyboard. The switches top left, labelled IV, III, II, and I, and the similarly labelled keys control the four memories of the machine. The white * key acts as a += key, and the grey * key acts as a -= key. With the cover and top of the card cage removed showing the 10 circuit boards, and the "Nixie" type display tubes. 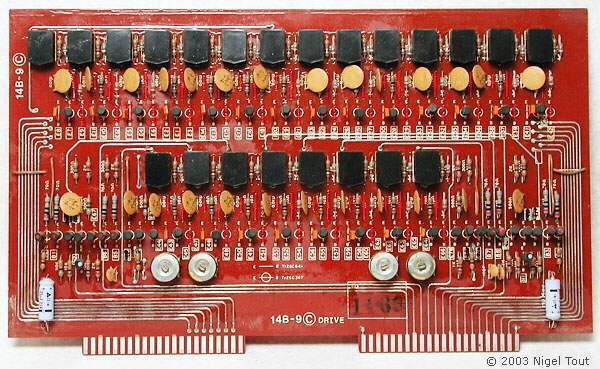 The memory board with the magnetic core module in the centre. 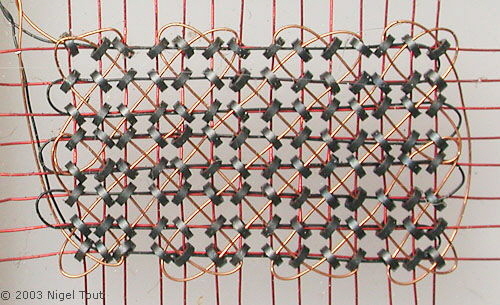 Close up fo the magnetic core module, showing the array of magnetic cores. 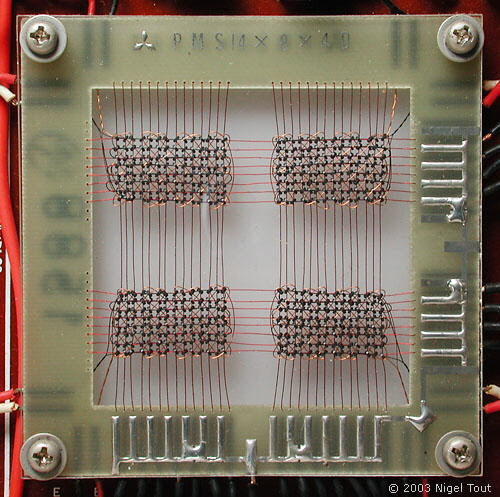 Click here to go to the page describing magnetic core memories. One of the sections of magnetic cores. The "Drive" board. The black items are 6-pin devices. 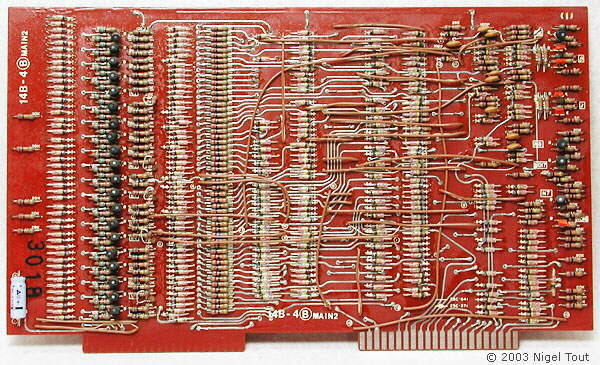 Board "Main2" which carries 24 transistors (vertical row of black blobs on the left) and 304 diodes. 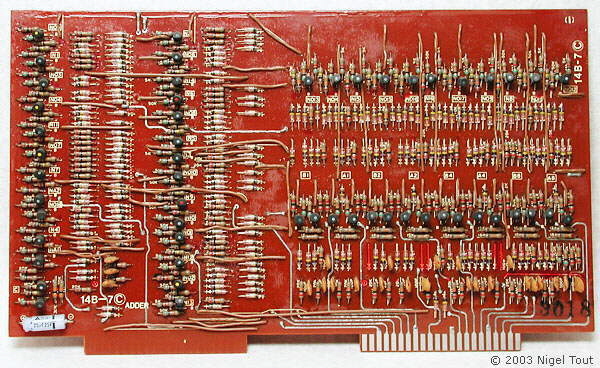 The "Adder" board which carries 54 transistors and 207 diodes. In the U.S., it's considered uneconomic to use magnetic core memory registers in electronic desk calculators. Acoustic delay lines are employed instead. cores are rarely designed into data processing systems which store less than about 10,000 bits. Not so in Japan. Casio Computer Co. of Tokyo adds to the growing list of electronic calculators with an entry which will sell for $900 in Japan. Like the Hayakawa Electric Co. [Sharp] unit its internal registers are made of magnetic cores. Masakatsu Ara, Casio's submanager for new product development, says the low price is possible partly because of the magnetic core registers. The limiting factor in core memories lies in the electronic circuitry which decodes addresses, drives current through the wires in the memory, and senses the output signals. Casio has used several techniques to help keep these costs down and make the use of cores economically feasible. Noise dies. For one thing, the memory is designed to operate at very low speeds; at these speeds the pulse signals have relatively slow rise and fall times, and therefore generate little noise. In fact, capacitively-coupled crosstalk is virtually nonexistent. There is also plenty of time for the noise that is generated to die away; the sensing circuits need not have a high noise-rejection capability. Thus the circuits themselves can be simpler and can be built with wide-tolerance components. Another important design feature is the serial loading and unloading of registers, one digit, or four bits, at a time. 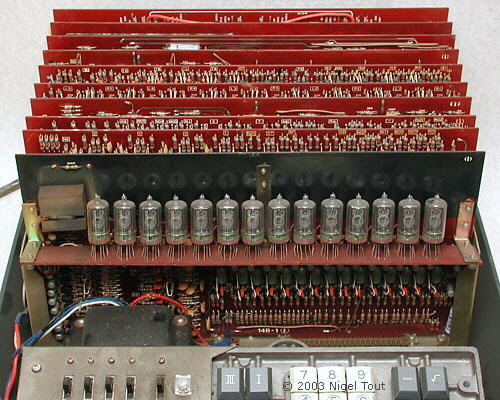 The memory has only four sense amplifiers and four write drivers, compared to the dozen or two of each found even in small computer memories. Teamed. Programed mode permits semiautomatic coupling to typewriter. Up to 14 digits. 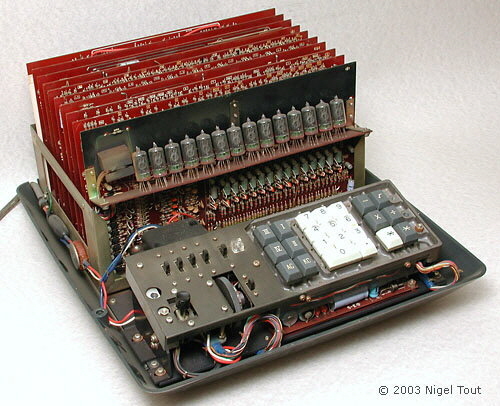 Using these techniques for a small core-memory unit, the Casio machine works with numbers of up to 14 digits. It stores them in four 14-digit registers, and two 7-digit registers. It also has a 30-digit program register, each digit corresponding to a single instruction. The machine has a 14-instruction repertoire, any of which can be stored in a single digit position; ten decimal digits require four bits for a binary-code representation, and four bits can represent up to 16 different symbols—the 10 digits and six others. The machine's output is through indicator tube; its input is from its keyboard or from a typewriter. The operator enters a program of up to 30 steps. 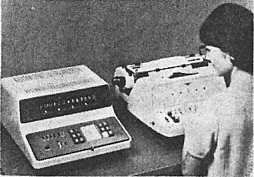 He then enters data into the various registers and the program makes its calculations on this data; results appear in the indicator tubes above the keyboard. A semiautomatic mode, using a typewriter, is also available. Brent Hilpert has brilliantly reverse-engineered the Casio AL-1000, starting from a non-working example, and has published detailed information and a simulator at https://web.archive.org/web/20161012153554/http://www.cs.ubc.ca/~hilpert/eec/misc/CasioAL1000Tech/index.html. If you are fluent in the Russian language then Vlad Brown has produced an article in Russian about the Casio AL-1000 on his IT related website at http://howtorecover.me/casio-al-1000. "The price is right -- even with cores", Electronics, Nov. 13th 1967, pp246-247.